Stingless Bees: Is there such a species? Yes! There are stingless bees. That is, there are bees that don’t have the capability to sting humans or other animals. You’d be surprised to find out where one species of stingless bee comes from. Australia is a continent that has gained a reputation of being a land that wants to kill humans. Indeed, it is full of snakes, spiders, crocodiles, and many other deadly creatures. So it’s particularly remarkable that Tetragonula Carbonaria, a variety of stingless bee, comes from the deadly “Down Under”. 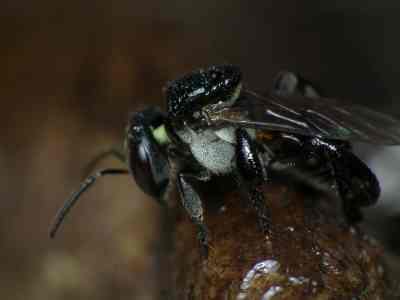 Also known as trigona, for short, these are small, dark-colored bees. They have their colonies or hives in the cavities of trees and other holes they can find to live in. Their nests can be quite large for such a small bee (5mm). You’ll see trigona bees in coastal areas such as Queensland and New South Wales, and they do live in urban areas as well as in rural, woodland, and heath, which is like a meadow or open area of uncultivated land with heather-like vegetation. Like more familiar varieties of bees, trigona bees eat pollen and nectar that they convert into a honey of thin consistency that Australians call “bush tucker” (food you can eat in the wild). 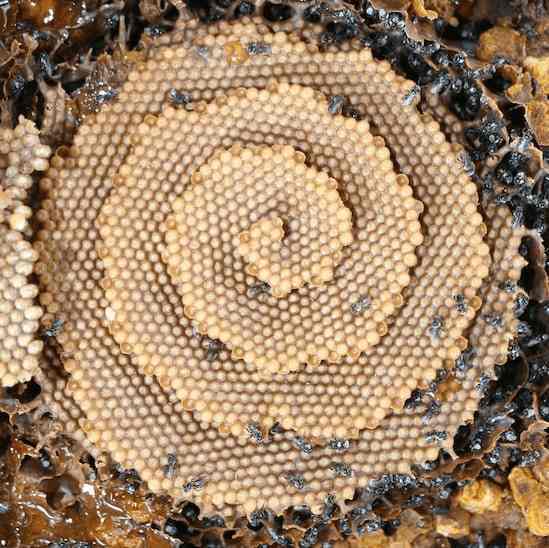 What’s unique about the hives the trigona bees create for themselves is the beautiful spiral structure. Trigona store their pollen and nectar in little “pot” structures on the outer edge of the hive and the queen puts her eggs into the honey- and pollen-stocked cells like regular bees. The cells are sealed off with wax to protect the larvae. So, the next time you travel to Australia, you can rest assured that at least one species of animal isn’t out to end your life or cause you severe pain. You may even get a taste of their sweet honey while you’re there! Source: Australian Museum, https://australianmuseum.net.au/stingless-bee, accessed 3 May 2018.